Winter is fast approaching, and it is a great time of year to shop for a new comforter. With so many options available, choosing the best comforter for winter can seem like a daunting task at times. Fills, thread counts, covers, weights - with so many different criteria and styles, how can we know which comforter is right for us? In this article, we will break down the available options for comforters and help you understand what type of comforter, or comforter set, is right for you! Comforter fill material is broken up into two main categories: Down, and down alternative. There are a variety of options available in each material, and each has major advantages along with some weaknesses. In this section, we will break down each material and highlight some of the critical differences between down and alternative fills. Down alternative comforters are generally filled with cotton, polyester, or rayon. These materials are meant to mimic the fluffiness and warmth of down, without adding too much weight. Down alternatives are generally less expensive than goose down, and they are a ‘vegan’ alternative to animal-derived down. Additionally, many people choose down alternative comforters because of their hypoallergenic nature when compared to a goose down comforter. Furthermore, many down alternative comforters are machine washable, making them much easier to clean when compared with down comforters that may need to be professionally washed. While a down alternative comforter may appear to be equally as fluffy - and cost half as much - as a similar down option, this may not actually be the case. Down, especially down of high quality, is extremely hard to beat when it comes to warmth-to-weight ratio. The down alternative comforter you are interested in could be twice the weight of its down counterpart. Furthermore, despite being less warm than down, down alternative is far less breathable - so you are more likely to wake up feeling clammy or sweaty. Finally, down alternative comforters are, in general, less durable than down. They have a tendency to shrink in the washing machine, as well as begin to pill and wear with frequent use and washing. This all being said, down alternatives are, in general, far more affordable and eco-friendly options. Even those who can afford a high quality down comforter may opt for down alternative if they have severe allergies. Simply put, down is a superior comforter fill material. Its warmth is unparalleled, and its warmth-to-weight ratio is absolutely impossible to beat. Alpinists climbing the world’s highest peaks in the most extreme conditions on earth use down jackets because they keep them warm while being light enough to climb with. The lightweight of down also translates to high breathability, so despite being extremely warm, you will not find yourself sweating in your sleep. Be aware that many down comforters are not suitable for machine washing. You may be unable to wash your comforter, or need to get it professionally cleaned. For this reason, a duvet cover is generally required to keep your down comforter in top shape. Down comforters are considerably more expensive than comparable down alternative comforters. Down has the potential to trigger allergy or asthma attacks as well. However, special downs are now being produced which claim to be hypoallergenic. ·400 or below: Summer use or for those who overheat easily while sleeping. 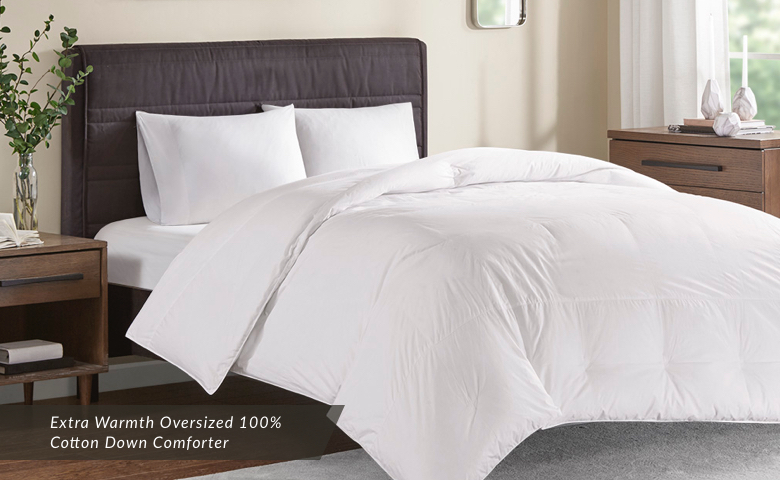 ·400-600: A versatile comforter fill power that can work at any time of the year. 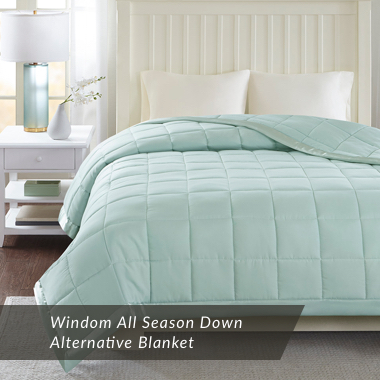 ·600-800: A warm down comforter that is appropriate for winter use or if you run cold at night. Another consideration when shopping for a down comforter is the fill weight. This is simply the number of ounces of down fill inside of a comforter. Keep in mind that high fill powers tend to have lower fill weights - because fill power refers to the ability of the down to trap air, not to the weight of the down itself. For this reason, a higher fill power down comforter that is suitable for colder temperatures may actually be lighter than a comforter with a lower fill power that is designed for warmer temperatures. The balance of fill power and fill weight determines a comforter’s warmth. That being said, higher fill power downs are generally reserved for use in warmer blankets, which is why the bulleted guidelines above are usually accurate. All this talk about fill power and fill weight is important because the temperature is a critical factor in our sleep quality. Too hot or too cold, and you risk sacrificing sleep. 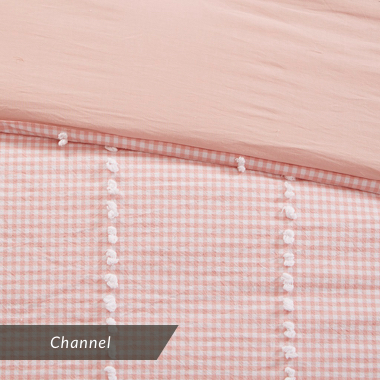 Channel: This comforter construction is relatively self-explanatory and features parallel channels of fill material. This does allow the fill material to shift within the channels, but if you like more warmth on one half of your body, or if you or your partner prefer more warmth, this shifting could be beneficial. 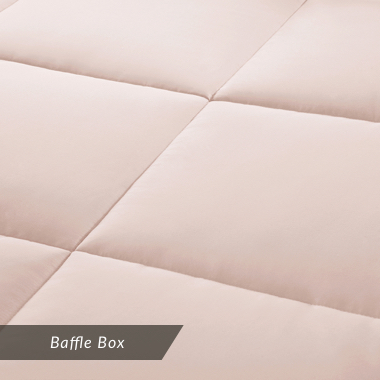 Baffle Box: You will not find many expensive down comforters that do not feature baffle box construction. These comforters have checkerboard stitching, with fabric baffles on the walls of each box of fill. These baffles allow the down to achieve maximum loft. They do not constrain the down, so baffle box construction does not sacrifice any warmth. Baffle box is the most expensive of all comforter construction types, and you get what you pay for. 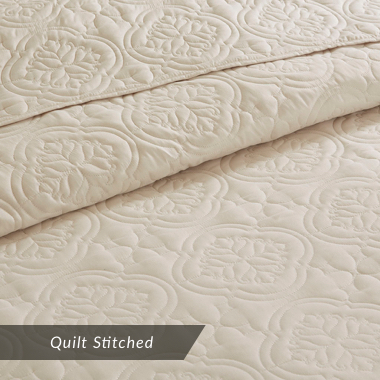 Quilt Stitched: Quilt stitched comforters are similar in appearance to baffle box constructed comforters. They feature the same checkerboard stitching, but there are no fabric baffles inside to keep the down from shifting within each box. This construction is adequate for lower fill power down comforters that are not used in an application which requires maximum loft and warmth. It is also a slightly cheaper alternative to baffle box construction. Gusseted: Most gusseted comforters feature baffle box construction as well. Gusseted comforters have fabric walls around the sides, which adds height and allows more loft. This is a premium feature that is usually coupled with a high fill power down. Gusseted down comforters with baffle box construction are the creme de la creme of comforter construction options. You should now have a good understanding of the various types of fill materials available in comforters and how to choose a fill material and construction based on your specific needs and budget. Now, it is time to consider the fabric that holds the material inside. This is an essential aspect of knowing how to choose the right comforter. Before diving into your options for fabric, consider this: If you are shopping for a down comforter, you will almost definitely be in the market for a comforter cover as well. This is because down comforters are difficult to wash and they require a cover to protect them. Therefore, the fabric of a down comforter won’t actually touch your skin. This may very well be the case for a down alternative filled comforter as well, but some are designed for use without a cover. The primary indicator of fabric quality. The higher the thread count, the more tightly woven and “fine” the fabric is. 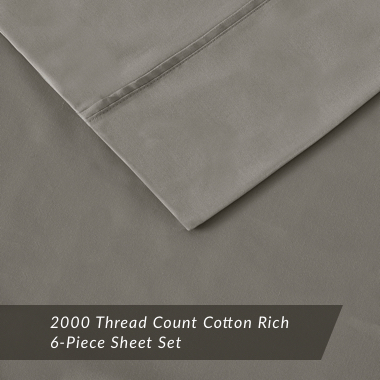 Literally speaking, the thread count refers to the number of threads that are contained within a square inch of fabric. That being said, a high thread count is not always better. The fiber material is also important, as is the specific way the fibers are woven. While higher thread count fabrics are generally of higher quality, they can feel stiff or thick if constructed poorly. When shopping for a down comforter, the thread count is an important consideration not so much because of the softness of the fabric (unless you will not be using a cover), but because a higher thread count contains down more effectively. We have all experienced down feathers sticking through comforter material and poking us when we are trying to get cozy. A higher thread count fabric helps to prevent this from occurring. A good general rule is to find a comforter with a thread count of at least 300. Don’t get persuaded to pay extra for much higher, though - if you are going to use a comforter cover, save the extra cash and buy a super-soft luxury option. Comforters come in many sizes. 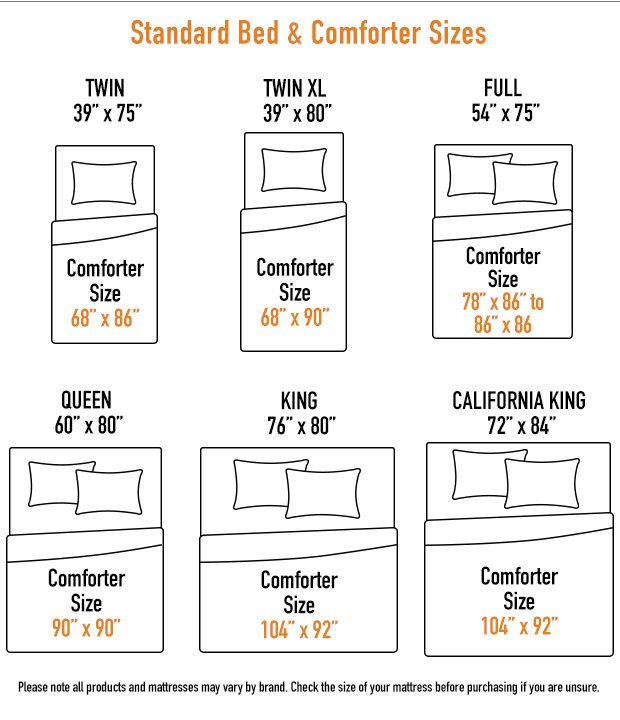 Down comforters are available in Twin, Twin XL, Full, Full/Queen, Queen, Oversized Queen, King, and Oversized King. Obviously, if you buy a comforter that is small than your bed size it will look silly and lack function. The decision comes when deciding whether to purchase a comforter that is oversized for your bed, so it will drape more off the sides. Some people think that oversized comforters create a more luxurious look. Functionally, more drape over the sides of the bed can trap heat better than a comforter who's bordering floats along the perimeter of the mattress. This is especially pertinent for couples who struggle with the classic “blanket stealing” dilemma. Another consideration pertaining to comforter size is how to fit it inside the comforter cover (if applicable). If you like the draping look of an oversized comforter but don’t want to pay the premium price, why not fit a standard comforter inside an oversized cover? Others may want more fluff inside of the duvet cover, in which case they would size the comforter cover slightly smaller. Usually, people do their best to match the comforter and cover size which is a safe choice that looks great and works well functionally. We hope these tips have helped you learn how to choose a comforter that helps you get the best night’s sleep! Be sure to check out Designer Living’s extensive comforter inventory for the exact blanket you want.